The Rosewood Hotel London opened in October 2013 following refurbishment and a rebrand. Housed in a 1914 Edwardian Belle Epoque building where features include a grand staircase of rare Pavonazzo marble, soaring archways and a classical central courtyard. Called the Belle Epoque courtyard it is home a market showcasing the best produce from locals and artisans. The hotels frontage is grade II listed. All bedrooms have marble bathrooms with bath and shower, robes, branded toiletries and hairdryer (and even weighing scales and salon grade hairdryer). Guest rooms feature wired fast internet access with other amenities include Air conditioning, wireless Direct dial telephone with voicemail, desk, clock, interactive flat screen TV (46 inch) with internet browser and bill view, iron/ironing board, safe, Tea and coffee in-room, Mini-bar and Television. Bedrooms have a top brand Hi-Fi system with iPod docking station. A 24 hour room service is available while maid service is carried out daily. The Bar: Designed by Martin Brudnizki. Features a real fire at one end and wooden bar running along the other. Warm and cosy the bar is set out to create discreet, intimate corners on a wooden herringbone floor strewn with hand-woven rugs. Serving beers, spirits, wines, cocktails and a large range of single malts. The bar prides itself on having Londons most intriguing and extensive selection of Whisky and Gin. Furnished with comfy armchairs where guests can relax and read, play games and dine at their own leisure. The traditional club menu focuses on a range of Indian curries and European-style casseroles. The Mirror Room: An elegant salon which is the social hub of the hotel, offering dining options for the most discerning palates. In keeping with its name the restaurant is decorated with mirrors on the walls and ceiling, the tables are laid with exquisite Limoges china, sparkling crystal and refined silverware. Serves lunch, traditional afternoon tea and dinner. Serves a selection of sandwiches throughout the day and night. Centred on local products and the Best of British, Holborn Delicatessen opens directly onto High Holborn with a range of delectable treats for those on the move. The deli stocks a wide array of fine British products, from marmalades and clotted creams to locally produced cheeses and ciders, and the daily take-away menu includes superlative bacon sandwiches and the freshest fruit at breakfast, lunchtime salads, sandwiches and specials followed by sweet treats and afternoon delicacies. Holborn Delicatessen: Serves house-blend coffees, teas and hot chocolates and Delicacies. Focussed on local and British products. The daily take-away menu includes bacon sandwiches and the freshest fruit at breakfast, lunchtime salads, sandwiches and specials followed by sweet treats and afternoon delicacies. Holborn Dining Room: 160 seat capacity. Formerly the East Banking Hall of Pearl Assurance. Located on the ground floor of the hotel, with direct access from High Holborn with a fun, relaxed and vibrant atmosphere reflecting the traditional heritage of the property. Serves traditional British dishes made from the finest locally sourced ingredients. Divided into eight sections: Bar Snacks, Cold Counter, Hot Counter, Grill, English Kitchen, Sides, Sandwiches and Afters. Furnished with impressive chandeliers, reclaimed oak furnishings, antique mirrors and leather upholstery. The dining room includes a bar and a dining counter, each topped with aged copper and patina brass and leads to The Terrace in the hotel's inner courtyard. Here guests can dine alfresco, or enjoy a fine cigar whilst looking out onto the Grade II-listed facade and up toward the cupola, which rises to 166 feet. The Gin Bar: Contained the largest collection of Gins at the time of opening in May 2016. The Gin bar is part of the Holborn Dining Room. One of the featured Gins is a rare 1950s Taplows but there are several hundreds of other options to choose from. You also have two dozen tonic options. There are a range of genevers, Gins Dutch historical predecessor. The lounge: Accessible 24/7 where a selection of teas and coffees are on offer. Scarfes Bar: features a roaring fire, cosy velvet armchairs and sofa seating, bookcases filled with over 1,000 antique books and low-key lighting. Decorated with characterful illustrations by artist Gerald Scarfe. Has a direct entrance off of High Holborn. open from midday to 01:00 a.m.
Reservations can be made for lunch which includes spicy Indian curries and European-style casseroles and is served from noon to 3:30 p.m. A range of bar snacks and light dishes are served throughout the evening alongside the range of cocktails, gins and whiskies. Over 200 single malts and a rare specialisation in sloe gin, including the hotel's own label. Lobby: A selection of teas and coffees are on offer in the showcase Lobby space. The Courtyard Terrace: Al fresco extension of the Holborn Dining Room, set in a serene Edwardian inner courtyard. Sit back and relax whilst enjoying a cocktail or two during the warmer months and a charcuterie board with a glass of wine during the winter months in this stunning enclave within the hotel. 13 meeting/function rooms where the largest room, the Grand Ballroom, can handle up to 436 delegates. Full range of audio visual and high tech amenities. The Renaissance has a dedicated business centre where you can take advantage of services such as PC hire, printing, copy, fax, messenger and parcel services, secretarial and translation services. Onsite is the 'Sense Spa', twice awarded day spa of the year at the British Beauty Awards. Here you can indulge in a range of treatments such as aromatherapy, fitness, specialist (CC Freestyle Back, Musical Energy Balance, Prenatal, Thai Herbal Heat, Hot Stone Body, Indian Ayurvedic Head, Chaturaang (four-hand), Ashtaang (eight-hand)) and traditional massages, Ayurvedic Dosha Packages, facials and full body treatments. The hotel has a fitness room with cardio machines and exercise equipment along with free weights. Personal trainers can be hired. Express check-in and check-out options. The Rosewood hotel has a full concierge service and the reception can help with currency exchange and safety deposit boxes. WiFi connection in public areas. Nearest: Tube Station: Holborn 211 yards (192 metres), Railway Station: Farringdon 0.6 miles (1 km), DLR Station: Tower Gateway 2 miles (3.2 km), Motorway: M1 Junction 1 6.1 miles (9.8 km). There are 5 tube (underground) stations within half a mile (0.8 km). The Rosewood Hotel, an imposing looking white construction, dates back to 1914. Its location on High Holborn (a major and busy through road) places it on the eastern edge of central London. The great thing about this location is that its within walking distance of the main tourist areas and nightlife and yet just over a mile from the City of London. Therefore for business travellers needing access to the main business sectors but also wanting to be near London's central hub it really fits the bill. High Holborn itself is part of the A40 which leads straight down to the City of London (Square mile) and offers plenty of shops, cafes and restaurants. Busiest during the week when the area is populated with workers that leave London on weekends. Holborn tube station is just 150 yards from the hotel. From there the electrical shops of Tottenham Court Road are one stop away (2 minutes) while clubs of Leicester Square are just two stops away (3 minutes). To the rear of the Chancery Court hotel is Lincolns Inn Fields, worth a quick look as it is London's largest Square and is said to have been the inspiration for New York's Central Park. Here you'll find Sir John Soames Museum , dedicated to the work of Architect Sir John Soane, R.A who lived here. It loess than half a mile to the west to find the major tourist area of Covent Garden. Part of London's theatreland, famous for its street buskers and central Piazza and home to the Royal Opera House. Other local places of interest include the British Museum (0.3 miles, 0.5 km), St Clement Dames Church (the RAF Church) (0.3 miles, 0.5 km), Dickens House (0.4 miles, 0.6 km), London Transport Museum (0.4 miles, 0.6 km) and the Courtauld Institute Gallery (centre of conservation and history) (0.4 miles, 0.6 km). Milesfaster ranking: 8th from 866 London hotels, and 5th of 131 five star rated hotels. Another to Consider: A similar type of hotel (size, rating) nearby (0.5 miles, 0.8 km) would be the 5 star Andaz Liverpool Street , with rates that start from about £161 and which has a 90% guest satisfaction rating. The Andaz Liverpool Street also offers: free WiFi. Prefer something with a higher guest rating? Then the 5 Star 41 Hotel may be one too look at being 3.0 miles (4.8 km) from the Rosewood London Hotel. The 41 Hotel has a perfect unblemished customer rating 100%, a truly stunning achievement. 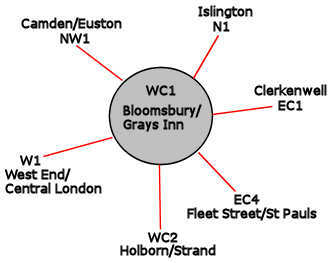 The 50 nearest hotels around this area (252 High Holborn, WC1 postcode) which we have have on our website extend out to a 0.7 miles (1.1 km) radius. The breakdown by star rating is 9 five star hotels (average rating 90%), 23 four star hotels (average rating 84%), 15 three star hotels (average rating 79%), 1 two star hotel (rated 70%) and 2 one star hotels (average rating 62%). Of the 50 local hotels top rated are Montague On The Gardens Hotel (4 star) and also the Covent Garden Hotel (5 star) (both joint top with 99%). Base Rates: We use base rates as a guide to the hotels starting rates. They do not include special offers and deals though so are just a rough guide. Taking all the hotels in the area together the average starting rate is £130 per night. Rates range from £52 at St Athans Hotel (1 Star, 79%) with top rates of £396 at Savoy Hotel London (5 Star, 91%). Rates broken down by star rating: Five Star average: £214, Four Star average: £136, Three Star average: £87, Two Star average: £58 and One Star average: £53. We rank hotels based on their guest rating but balanced for their influencing factors. We rank Rosewood London Hotel 3rd of 50 and 2nd for the 9 five star hotels in the area. For lowest base rates in the area this hotel ranks 49th of 50 (8th of 9 five star hotels.). Our ranking for this hotel based on both its rates and its user rating is 2nd of 47 for pure value for money (Covent Garden Hotel was top). Name change to Rosewood London from Chancery Court in October 2013. Was the Renaissance Chancery Court Hotel till 2011. The Catey Awards 2017: Hotel of the year, group category.